From time to time, we like to clue our readers in on interesting musical events or theatrical happenings or general cultural arts festivities. Well, today, we've got something that kind of combines a little bit of everything, and given the inclinations you probably already have if you're a reader of this site, this festival might be very appealing. 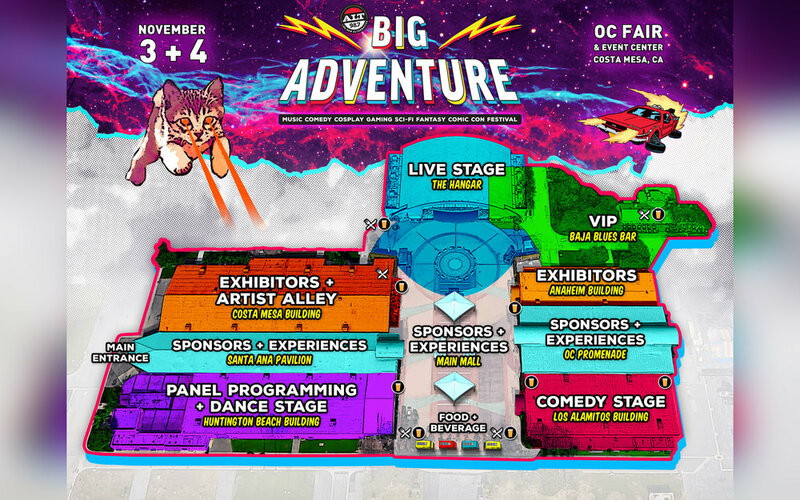 The first-ever Big Adventure Festival is a Frankenstein'd combination music, comedy, cosplay, gaming, sci-fi, fantasy, comic con, and all around nerd festival coming to the OC Fairgrounds this November. Yes, that's the same site as the OC Fair (starting today, by the way! ), hosting two days of all things funny and groovy and nerd culture (for lack of a better phrase). The musical line up is full of alternative and indie artists, while the Dance Stage will host a series of rising EDM artists. That's before you get to the comedy lineup, which features heavy hitters and brilliant stand-up comics you've seen on TV, movies, and comedy clubs around. Festival lineup poster courtesy of Big Adventure Festival. Usually, festivals stick to one genre, but Big Adventure seems determined to blend multiple interests together. Fortunately, the resulting combination looks to be an exceptionally fun time. Tickets go on sale today, and the discounted Early Bird passes are sure to go fast. If you feel like you'll be in need of some cheering up after Halloween passes this autumn, go check out Big Adventure Festival! It's sure to be an exciting time! During the day, attendees will have the opportunity to see some of their favorite cast members and special guests during the TV, Film, Gaming, and Comic Book panels, participate in interactive fan experiences, VR, laser tag, table top and video gaming, and tech demos, and visit the artist alley where some of the comic book industry's top artists and creators will be speaking about their craft, selling artwork, meeting fans and signing autographs. In the evening, the focus will shift to live performances, when fans will witness sets from acclaimed comedians including Patton Oswalt and Jim Jefferies, along with some of today's top alternative and dance music artists including Empire Of The Sun, Modest Mouse, Phantogram, Cold War Kids, What So Not, Rusko, and many more, spread across three entertainment stages. "More than just a comic con, more than just a festival, Big Adventurereally is a one-of-a-kind celebration of pop culture and fandom in all forms," says Big Adventure co-producer Rob Tweedie. "I've waited in my fair share of comic con lines over the years, sometimes even overnight. I love the tangible, face-to-face fan experience and the freedom to be yourself that the cons offer. Our goal is to combine that great sense of wonder and community with the excitement and energy of an outdoor festival to create an authentic entertainment event that is truly unique and out-of-this-world. Big Adventure has been a passion project for us at SGE for a while and we're buzzing with excitement to see it come to life with all of you." Modest Mouse will be among the bands playing at this unique festival. Photo by James Joiner, courtesy of Big Adventure Festival. Ducky is one of many electronic artists to be featured. Photo by Sean Moore, courtesy of Big Adventure Festival. *Seating is available on a first come, first served basis. Ultimate VIP seating closes 5 minutes prior to show start time. Don't be late! Alt 98.7 Presents Big Adventure is proud to partner with the following sponsors in its inaugural year: Angel City Brewing, Corona, Kraken Rum, Cosmic Fog, Rockstar Energy Drink, Musicians Institute, Mike's HARDER, and D-Link.